At the end of next year, Costa neoRiviera is going to be transferred to the AIDA brand for use in their AIDA Selection program. The ship will be refurbished and renamed AIDAmira before its first cruise for AIDA on December 4, 2019. The complete story appeared in the May 25 edition of Cruise News Daily. Royal Caribbean brands committing to buy chicken from processors that guarantee more humane treatment of the birds. Details appeared in the May 25 edition of Cruise News Daily. If the point of christening a new ship is to be noticed, Carnival took their best shot yesterday, but it takes a lot to get noticed in New York. How could anyone not notice a 133,500-ton ship with Queen Latifah headlining a lip-sync battle with Philadelphia Eagles Super Bowl champion Jake Elliott? In New York, you never know. In an other-than-classic ceremony, Queen Latifah named the ship and christened the ship by pouring champagne on the ship's bell. The complete story appeared in the May 24 edition of Cruise News Daily. PLEASE NOTE: The video contains quick edits in places with flashes of light that may affect some viewers. If you are susceptible these, PLEASE DO NOT WATCH THIS VIDEO. P&O choosing a name for its next ship to join the fleet in 2020. Details appeared in the May 24 edition of Cruise News Daily. Windstar has returned to Alaska after a 20-year absence. The boutique line returned to the 49th State with the 212-passenger Star Legend for 25 sailings in 2018 and 2019. The complete story appeared in the May 23 edition of Cruise News Daily. At approximately 9pm this evening, the US Coast Guard suspended their search in the Gulf of Mexico for the 50-year-old man who apparently went overboard from Carnival Paradise yesterday as it was sailing from Tampa to Key West. Details appeared in the May 23 edition of Cruise News Daily. Most of our readers really won't be interested in the fact that Global Ports Holding has signed an agreement to manage the cruise port at Havana for 15 years. They will, however, be interested in the effect of it. They should prepare for a significant increase in the number of cruises including calls at Havana, and chances are good that their next cruise may include a Havana call. The complete story appeared in the May 22 edition of Cruise News Daily. A 50-year-old man from North Carolina went overboard from Carnival Paradise this morning as it was traveling from Tampa to Key West. Details appeared in the May 22 edition of Cruise News Daily. 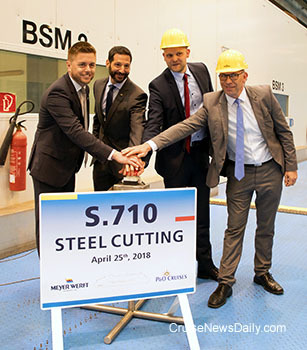 Meyer Werft announced it has cut the first steel for hull number S.710, which is a 180,000-ton vessel ordered by Carnival Corp for their P&O UK brand. 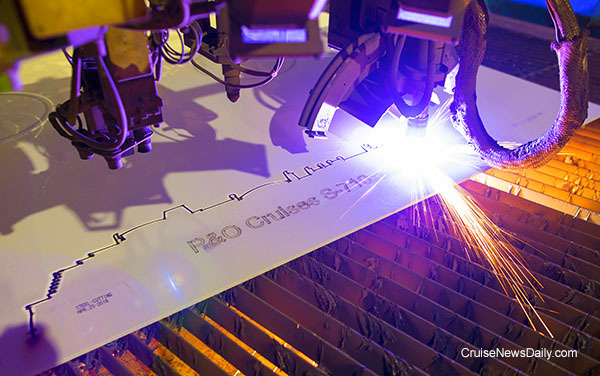 The Papenburg yard will deliver the ship in the spring of 2020. A sister ship is on order for the brand for delivery in 2022. The complete story appeared in the May 21 edition of Cruise News Daily. Pressing the button to start the plasma torch are Paul Ludlow (SVP P&O Cruises), Josh Weinstein (Carnival UK President), Tim Meyer (MDirector Meyer Werft), Stephan Schmees (Member of Project Management, Meyer Werft). Photos courtesy of Meyer Werft and P&O Cruises. All rights reserved. May not be copied or used without express permission. An Australian man in his 80's went overboard from Sun Princess about 1:30pm on Saturday when it was approximately 100 nautical miles southeast of Singapore. Princess said it appeared the man went overboard intentionally. Details appeared in the May 21 edition of Cruise News Daily.